Devour delectable drinks and desserts at these creative, retro Nakazakicho retreats. The wonderful thing about Nakazakicho is that many café owners have come to the area not just to open a café, but to create a unique artistic space, or a haven of relaxation. Cafe Muni, with its hanging pot plants, bunches of dried flowers, and mosaic lanterns is one of these peaceful sanctuaries. The café is in one of the oldest nagaya (traditional Japanese wooden buildings) in the area – it is 160 years old. Owner, Yoko Tatera, who opened shop in 2009, lovingly bakes homemade whole-wheat sourdough bread to serve with her tasty lunch sets of spicy beans, minced meats, salads, and pasta dishes with homemade sauces for ¥860. One of the best parts about visiting Cafe Muni is hanging out with Yoko’s little dog Komuni-chan, who is the café’s unofficial mascot and who can be seen sprawled out on the shop’s front doorstep on any given day. Yoko makes one of the best chai teas in town, flavored with natural kibisato (mineral sugar), and both her creamy tiramisu and her matcha and white chocolate cake (¥410) are truly worth making a special trip for. In our modern world of smartphones and e-readers, sometimes we miss the sensation of holding a real book in our hands and thumbing through its pages. When this sentiment hits, there’s no better place to go than to ARABIQ Books & Gallery Cafe – a fixture on the Nakazakicho scene since 2007. Founded and run by former town planner Ken Moriuchi, this haven of coffee, art, and literature is named after a bar in the well-known Japanese mystery novel Kyomu-eno-kumotsu, one of the country’s most famous detective stories. With its warm, cosy interior lined with tall, disheveled bookshelves, retro chandeliers, and the latest art exhibit which changes once or twice a month, it is the perfect place to lose yourself in a good book or catch up with an old friend. 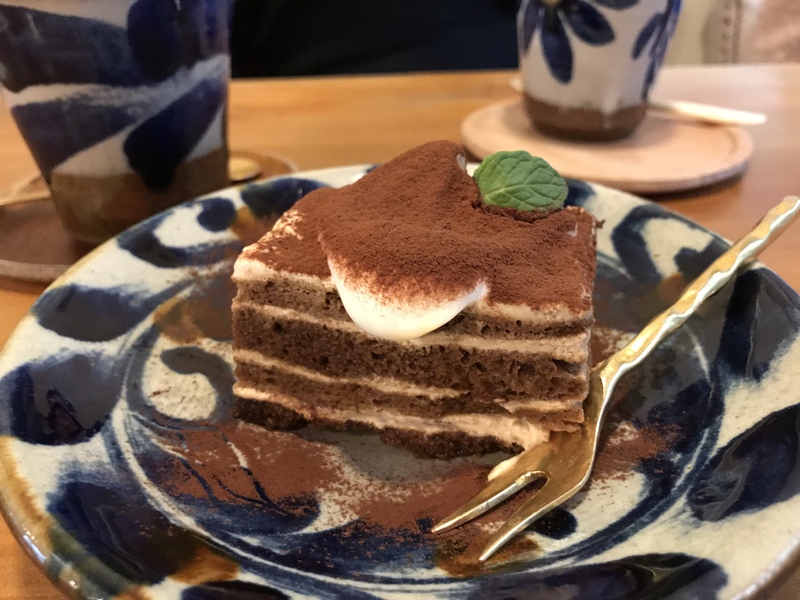 You can’t go past the chocolate cake or the tiramisu (¥450), and the drinks menu is almost guaranteed to have something you’ve never heard of or tasted. Ken recommends the Fieker (coffee with Austrian rum) or the Maria-Theresa (coffee with orange liqueur, whipped cream and hard candy sprinkled on top), apparently a current favorite on Instagram! For one of the most divine cheesecake experiences in Osaka, look no further than kitsch but comfy Taiyou No Tou. Cake sets run for ¥1,000 here and include your choice of tea or coffee with one of their delectable creations, such as the creamy cheesecake with homemade berry and custard sauce, or the dreamy chocolate ganache tiramisu tart. If you’re craving an early lunch, go for the Obanzai lunch set – a nutritious plate of three side dishes of your choice with brown rice and miso soup. The free WiFi here is a plus for those without a connection or for anyone looking to get a little work done, but if you’re having a connection-free day, the interior of Taiyou No To is more than enough to keep you intrigued with its mismatching hanging lights, retro furniture, and unique crockery. Near the entrance, stacked next to a collection of flyers and postcards, you can find free foldout maps of Nakazakicho, and the friendly staff members are more than happy to recommend places to check out in the neighborhood. Refreshingly, like many of the cafés in the area, this one is completely non-smoking. Where Japan’s famous lunchbox came from, and tips on making yours into a work of art. Sip green tea while devouring gourmet Japanese sweets in these quaint Kansai tea cafes. Slurp your way around the city following the Osaka Ramen Route.